Slow Cooker Shredded Beef White Enchiladas. Ohhh my gosh, hello new favorite meal. These slow cooker beef enchiladas taste like heaven. Like I died and went to heaven. I don’t know what is better… the slow cooker beef or the white enchilada sauce that I practically want to drink with a straw. WAHOO. Let’s get into it. This is another one of those meals that I like to have in my arsenal for December. Sort of like the bacon meatballs. Enchiladas make an excellent meal to serve at a holiday party, to make for guests that stay a few days, to make and freeze for later and heck, to even make ON the holiday itself! So here’s the thing. When I was sick early on in my pregnancy with Emilia, I had an aversion to pretty much everything aside from Mexican food. I mean, that could almost be daily life for me too (when do I NOT want tacos?) but this was bad. I wanted NOTHING else except for these shredded beef chimichangas at a local restaurant and it wasn’t even that I was craving them. It was just that they were the only thing that sounded good. I’m pretty sure I ate them once a week for four weeks straight and Eddie was completely burnt out on any sort of shredded beef and tex mex meal. I knew that a request like this meal would come around again though, so I had to be prepared. The best part! This beef can really be used for… anything. Any sort of Mexican or tex mex inspired meal. It’s a chuck roast that you slow cook overnight (okay, or throughout the day, whatevs) and season with lots of delicious taco-like spices. Once it is ridiculously tender and falls apart when touched with a fork, the beef goes inside warm tortillas and then gets a nice blanket of white enchilada sauce. This freaking sauce. What the what. It is to die for. Just so delicious. There is no other word. I just want to cover my entire life with it. I find the flavor is best when the beef is seared first. My slow cooker sears the meat, but if yours does not, heat a large pot over medium to high heat and add the oil. Sprinkle the chuck roast with the salt and pepper, then add it to the pot or slow cooker and sear on all sides until deeply golden brown. If necessary, transfer it to the slow cooker. Cook on low for 8 to 10 hours, until it easily shreds with forks or kitchen tongs. Toss in the cumin, paprika, chili powder and garlic powder, mixing well. Your beef is now ready to use! To make the sauce, heat a skillet over medium heat and add the butter. Add in the onions and green chilies with a pinch of salt, stirring well. Cook, stirring occasionally, until the onions soften, about 5 minutes. Stir in the flour and cook for 5 more minutes, stirring often, until the mixture smells nutty and fragrant. Very slowly pour into the chicken stock while stirring so the mixture thickens. Bring it to a simmer and let it thicken and bubble for 5 minutes. Reduce the heat to low and stir in the sour cream and the half and half. Stir until combined and cook for 5 minutes, until warmed through. Stir in 1/2 to 3/4 cup of the cheese until it melts completely. At this time, you want to warm your tortillas so they don't break - either pop them in the warm oven for two minutes or so or you can even microwave them. Spoon a bit of the sauce into the bottom of the baking dish, just to coat the dish. Take about 2 tablespoons of the shredded beef and roll it up tightly in the warm tortillas, placing them side by side in the dish. I can usually fit six of the small tortillas in two separate rows in a 9x13 dish! Pour the rest of the sauce overtop of the enchiladas, covering every bit. Top with the remaining monterey jack cheese. Bake for 30 to 35 minutes, or until the sauce is golden and cheesy and bubble. Remove and top with the cilantro and green onions before serving. 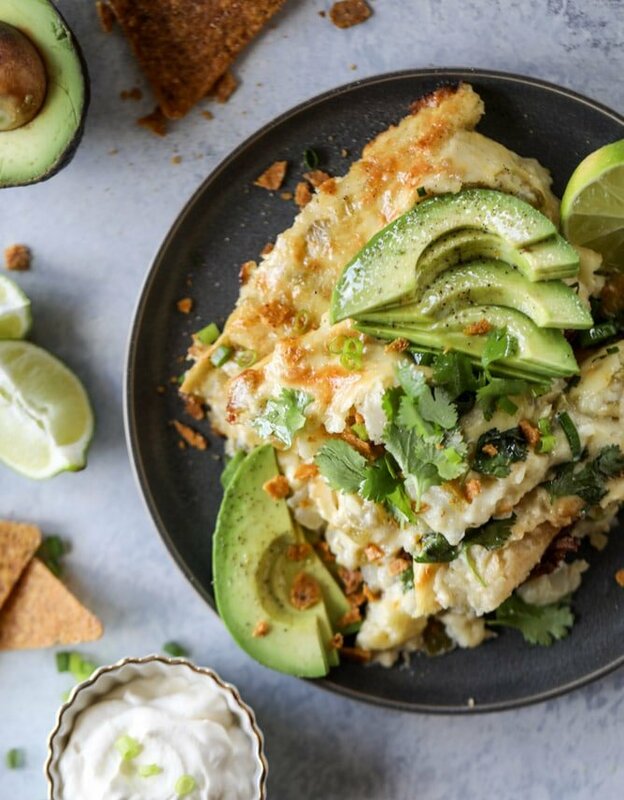 I love to serve these with avocado slices, lime wedges and tortilla chips! Well hello there, Lover! I’m not pregnant, but I could definitely get on board the daily Mexican food bus. I was raised on tacos every Sunday (we called ourselves Episcotacopalians), and my parents would host annual enchilada feasts and fill th bathtub with trays of enchiladas as the prepped the day before. I am so with you on this! That sounds amazing! I love enchiladas more than any other Mexican food, and always get them when I go to a Mexican restaurant. Cream or cheese sauce is my fave, not sure if I’ve even tried red sauce, lol. These are an absolute must in the near future! Did you put any liquid in the Crock-Pot to cook the chuck roast? nope i do not! i find that the meat releases enough liquid. if you’re afraid to do that, you can always add some stock or water! Could you use flour tortillas instead of corn tortillas? of course! use your favorite! Flour totillas are not tradionally used for enchiladas for a reason: they get soggy and gummy when cooked in a sauce. There are gourmet tortillas on the market that are a combination of flour and corn and they hold up better than plain flour. Save the flour tortillas for soft tacos burritos or for fried items as chimichangas. I’d live to make this. Would it be pissible to email the recipe. thanks gloria! you can print the recipe above from the print button! OMG, these sound delish! I have a potluck bridal shower this coming weekend and the theme is Mexican for the menu. I am definitely making these! I love making the red sauce and the green sauce but I can honestly day, I have never made a cheese sauce enchilada. Thank you for sharing this recipe!! How do you think this would be with chicken instead of beef? Not a beef eater but these sound relish! i definitely think chicken can work! Will try to make it that way I’ve never made them that way but sounds good ! I am SO excited !! i have a ton of pork to use… ok to swap and follow the recipe exactly? Yes, pork is great with this recipe. I am gluten free, could I swap the flour for cornstarch in the sauce?? I’m thinking I could try gf ap flour too?? I am going to make these tonight, and didn’t get started early enough, and am trying to figure out how to use my Instant Pot. Sorry, this is such an obnoxious comment, but do you know how to adapt it for the IP? i wish i did carrie, but i don’t have an instant pot! so i’m not sure how they work. is there a chunk roast/pot roast setting or something? i think that would work! Hi! I made these last night for my two boys and they LOVED them (even the one who swears he doesn’t like enchiladas). I seared the meat in the instant pot and then cooked on high pressure for 60 mins (added 1 cup broth per braising guidelines for pressure cookers). It wasn’t quite “falling apart” at that point so I re-sealed and set for another 30 mins. If you were worried about overcooking, I think you could pressure cook for 60 mins and then set to slow-cook to monitor progress. There was a LOT of liquid, I simply removed the meat to shred and then added the spices. Hope this helps. I love your recipes, but hate when I print them out I lose the picture! Please include pics in your printables (or at least the option to include a visual)! Thank you! These look so amazing! Seriously the beginning of pregnancy is the worst nothing sound good but wait I’m starved omg that makes me sick ugh! Made these tonite with flour tortillas and they were delicious! Next time, I will try them with corn tortillas! The meat was delicious and would be great as tacos or in quesadillas or even on top of a salad. This recipe is a keeper!! I agree cheryl, but howabout that sauce?? These sound so very delish! 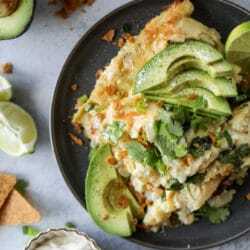 Where can I find the nutrional information on this recipe. I would really love to k ow the calories. I would like to make these for Christmas Eve but want to make them the day before. Can you give me a suggestion on the best way to do this? I’m worried about putting the sauce on and having them sit in the refrigerator for up to 24 hrs. Thank you! i always make enchiladas ahead of time, but honestly have never made the white sauce ones ahead! i actually think it will be okay though? if anything after heating them up, you might need to add a few teaspoons of milk interspersed throughout the pan and heat for a few minutes more? that’s what i would do! Thank you! I am not as confident a cook as you so I’m going to figure out something else to make ahead of time and try to do these day of. I’m super excited to try them! Hi Jessica (and Heather Allen), I had the same plan and was hoping to make ‘em today to serve tomorrow with leftovers for the rest of the week. What would you recommend, doing all the steps BUT putting them in the oven or going ahead and cooking them, and reheating them again tomorrow? Keep in mind I’ll be following the recipe to a tee with the exception that I’m substituting shredded rotisserie chicken in for beef. Heather, did you ever get the chance to make these ahead of time? What were the results? Thanks in advance! Seriously so excited to make these. Made this for dinner tonight and my husband and one year old inhaled it! For those wondering, I also did the beef in the Instant Pot – 1 cup of beef broth plus the chuck roast for 60 minutes on the “meat stew” setting with natural release. Came out perfect and fall apart tender. Sauce is NEXT LEVEL. Thank you!! We made these a couple weeks ago and they were amazing!! I’m wondering if the sauce would freeze well. I’d love to make big batches of it to always have on hand!